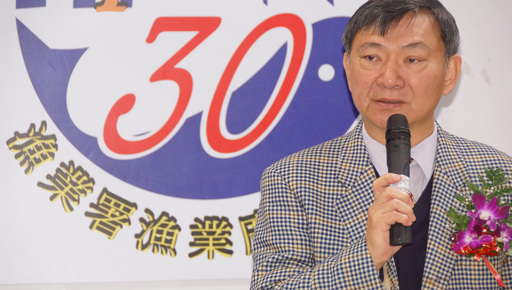 Taipei, April 14 (CNA) Fisheries Agency Director-General James Sha shared a rare insight into a number of breakthroughs in recent talks between Taiwan and Japan that eventually led to the signing of a bilateral fishery pact. Sha told CNA in an interview that there were several breakthroughs during the month-long talks that eventually led to the April 10 signing of the pact. The first was on March 6, when Japan sent a ministerial-level official from its Ministry of Agriculture, Forestry and Fisheries to Taipei to discuss the pact. Sha reported to the Presidential Office after those talks that "it is best to solve the easy part of the dispute with Japan first, followed by the more difficult part," adding that "waters north of the Yaeyama Islands are crucial and should be a priority for discussion." The Yaeyama Islands are located southwest of Okinawa Prefecture and the waters to the north of the islands are a rich fishery resource. With the consent of higher-ranking officials, Sha said, he then proposed in a second preparatory fishery meeting March 12 to leave waters that lie north of latitude 27 degrees north and south of the Yaeyama Islands off the table. The move was aimed at reducing pressure on Japan, as the area constitutes 80 percent of the fishing grounds of the Ryukyuan people who live in Okinawa Prefecture, he said. Later, when Japan made little concessions during a March 19 meeting, Sha told a Japanese official from Japan's Ministry of Foreign Affairs that the talks would come to an end if Japan remained unbending. At one point, he left the table and halted the meeting. This protest led Japan to understand that Taiwan wanted to see real progress on the pact, according to Sha. Under the terms of the agreement signed April 10, Taiwanese and Japanese boats can operate freely in a 74,300-square-kilometer area around the Diaoyutai Islands, according to the Fisheries Agency. This gives Taiwanese fishermen an additional 4,530 square kilometers in which they can operate free of harassment, the agency said. The area also includes some of the waters north of the Yaeyama Islands and southeast of the boundary claimed by Taiwan. The Diaoyutais, some 100 nautical miles northeast of Taiwan, have been under Japan's administrative control since 1972 but are also claimed by Taiwan and China.